Design: Starter must be on the Drivers-side. Primary tube size: 2" O.D. Collector size: 3.5" with 3.5" 3-bolt flange. O2 Sensor bungs: Built into the collectors. Flanges: 3/8" thick, laser-cut, contoured for a leak free fit. Material: Constructed of 16 gauge mild steel tubing. Mandrel bent on sophisticated computer controlled bending machines for precise fit and uninterrupted exhaust flow. The mandrel bending process maintains a constant inside diameter of the tube for a smoother finish with no restriction of flow and no crimping of the tubes. One piece design: One piece header tubes / No slip tubes. Under chassis design: Above the steering center link design offers maximum header to ground clearance. Header set includes: Header gaskets, 16 header bolts, header reducer adapters with 3-bolt gaskets & hardware. 67-76 A-BODY, 62-74 B-BODY and 70-74 E-BODY CHASSIS. Steering Linkage: OEM with torsion bars. Headers will not clear UniSteer Performance Rack and Pinion. (!) 545RFE Transmission: Headers will not clear the passenger-side bellhousing. Note: Correct installation of the Keisler Tremec TKO-500/600 Transmission is imperative. The output-end of the tail shaft must be in exactly the same position as the stock transmission output shaft for the headers to fit properly. Flywheel: Standard Trans applications with an 11" 143-tooth ring gear must use a Chrysler lightweight mini starter #56029274AA. Clutch Linkage: 67-76 A-body applications must use a hydraulic clutch. DYI alternative, modify your Z-bar linkage to achieve clearance. TTi does not make a linkage to satisfy this situation. 62-74 B-body & 70-74 E-body applications can use a hydraulic or mechanical Mopar clutch linkage system. DYI alternative: Modify your shift linkage to achieve clearance. TTi does not make a linkage to satisfy this situation. 67-76 A-body applications: Must use a BORGESON power-steering unit 800118 or 800119. DYI modification required to the mounting holes. The three mounting holes must be elongated to .810" to allow the steering unit to be moved away from the engine for adequate clearance from the header tubes. 62-74 B-body & 70-74 E-body: Clears power-steering; OEM & Borgeson units. Will not clear a factory low-mount air compressor. (!) 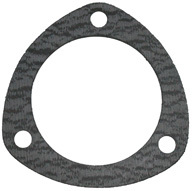 Standard Trans applications with an 11" 143-tooth ring gear must use a Chrysler lightweight mini starter #56029274AA. 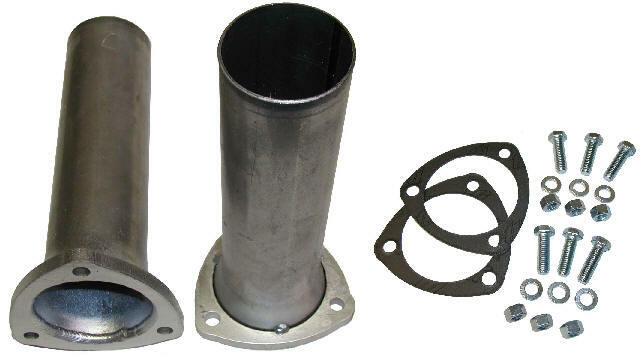 66-74 B-body & 70-74 E-body stock suspension applications require an ANGLED JEEP/TRUCK OEM FILTER ADAPTER. Our headers were designed to fit with the engines located to the factory specifications. If the engine is not located correctly in the chassis, the headers will not fit properly. We strongly suggest you check your engine location prior to installation. Due to various manufacturing designs, aftermarket parts, engine configurations, suspension combinations, etc... TTi cannot ensure headers and exhaust systems to fit all combinations. However, we have done our best to accommodate both factory and aftermarket component combinations. In some cases, slight modification or repositioning may be required on your part to clear the specific situation. Header sets include: Header gaskets, 16 header bolts, header reducer adapters with 3-bolt gaskets & hardware. 67-76 A-body, 62-65 & 73-74 B-body stock suspension applications. Rubber Insulators are not included. 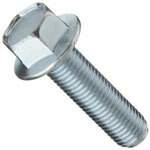 The stock insulators can be used, however they will require modification. (!) Spool mounts will not clear a factory low-mount A/C compressor. An oil filter blocking plate is required in conjunction with a remote mounted oil filter kit in 67-76 A-body, 62-65 & 73-74 B-body stock suspension applications. Recommendation: Use a very thin layer of High-Temp Silicone Sealer on each side of gasket. Note: (2) Supplied with header purchase. Note: (16) Supplied with header purchase. HEADER REDUCER ADAPTERS to transition headers to an exhaust system. Made of 16 gauge aluminized tubing, 3/8" thick flanges, includes 3-bolt gaskets & hardware. Note: (1 set) Supplied with header purchase. Size required when ordering. Evacuation tubes and EGT probe fittings can be installed prior to coating headers. Installation of these options are considered a "Special Order". Please allow an additional 3-4 weeks for the special order work and the coating process. Note: TTi requires a $100 non-refundable deposit for all Special Orders prior to the start of your order, the balance will be due upon completion. 1/2" pipe, 3.5" long, external thread, cut at 45º angle. Installation locations: Drivers-side, 9 o'clock / Passenger-side, 3 o'clock. * The 3.5" long threaded tubes will be used from the kit and installed in the header collectors. Installation locations: Drivers-side, 9 o'clock / Passenger-side, 3 o'clock. 304SS EGT fittings, 1/8" pipe, internal thread, commonly installed 1" from the header flange. (!) When ordering, specify which header tubes.